While MESHUGGAH have morphed from angular, frenetic death metal to something a more polyrhythmic, less chaotic sort of death metal band, they've picked up a lot of fans along the way. History has borne out that Sweden has one of the most prolific music scenes out there (helped, in no small part, by governmental support of musicians and other artists – can you imagine how many good bands the US might launch if Uncle Sam subsidized six-stringers?). However, Swedes rarely prove the most adventurous of musicians, often finding a formula and riding that pony straight to the glue factory. 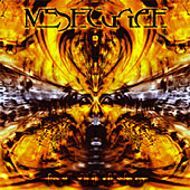 On their second album Destroy Erase Improve, MESHUGGAH won over underground fans in droves, and their follow-up, Chaosphere, was no more accessible yet began to see them transcend a subterranean following. It was this album that earned them an invitation to be the sole opening act for a US arena tour with TOOL, and also landed them a slot on the side-stage at this year's Ozzfest after Jack Osbourne used them as his music of choice to retaliate at some annoying neighbors. Fourth album Nothing offers all you've come to expect from the quartet — a nonstop flurry of down-tuned guitars coming down in staccato waves in complex patterns, drums that play perfectly off the intricate arrangement of the riffs, and uniformly barked vocals. This time out, the band reduce their once-breakneck pace to something that's more pedestrian in tempo but no less tricky, and have integrated eight-string guitars into their repertoire in order to deepen their bottom-scraping tones. Short of that, everything remains intact from previous albums, and no radical new elements have been introduced, probably to the relief of fans who expected a more commercial sound this time around due to their increased popularity. Guitarists Fredrik Thordendal and Mårten Hagström often dip down below nu-metal tuning as a result of their new weapons of choice, but the result is about as far removed musically and lyrically from KORN and Kompany as you can get. Vocalist Jens Kidman can grow a bit tiresome as singers go, as his full range seems to consist of shouting abrasively, shouting abrasively at a slightly higher pitch…and that's about it. Only on "Spasm" does he attempt a "technospeak" sort of delivery and it works well, bringing VOIVOD frontman Snake to mind. It would be hard to imagine anything different next to their music, but it also makes it harder to differentiate one song from another. Add to that a near-total lack of any kind of focused repetition or anything resembling a chorus, and as a result it's easy to get through the entire record a few times without clearly being able to recall a single memorable highlight. It doesn't make them less enjoyable — just a little maddening. Fortunately, MESHUGGAH don't give a damn what I think, nor you, and therefore it's almost impossible to try and put a number rating on bands like this, subjective a listening experience as they are. It's not a record I would reach for often, even though I find them ten times better than a band like MANOWAR. Objectively, they're tight as hell, toying with the boundaries of what makes commercial music work (although perhaps not experimenting as much as they could), and sound like nobody out there. From that perspective, they're the kings. On the other hand, a lot of people want heavy music in pop song structures – something close to Verse, Pre-Chorus, Verse, Pre-Chorus, Chorus, Verse, Chorus, Chorus — as even extremist faves like SLAYER, MORBID ANGEL and SUFFOCATION did it that way. You won't find any of that here, and so people who like non-linear music or their previous albums should add a couple points to the rating above. Those who want songs and not just parts, subtract three.